It’s time for a grab-bag Thursday post! Let’s see, what shall we talk about first… how about pirates? 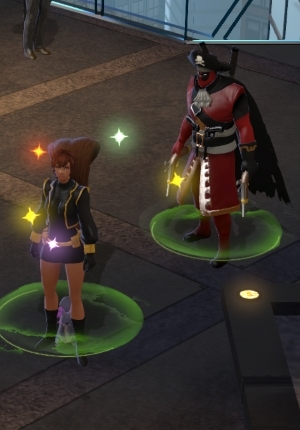 Marvel Heroes: Last night I made it my mission to acquire the free Pirate Deadpool team-up from the secret achievement chain that was recently added to the game. Not that I really needed another team-up — I’m pretty much swimming in them at this point — but free is free, and who wouldn’t want a sarcastic pirate shadowing them? Start to finish, it took me about an hour and a half to do. The tricky part was that most of the achievements didn’t trigger until I teleported back to a hub, which meant that I kept having to head back to see if I had acquired the next step or not. I took Squirrel Girl along for this one because she can roflstomp just about anything now and that’s pretty fun to see. Our new guild, Massively Underpowered, is growing by leaps and bounds! It’s great to see bloggers, friends, and MOP readers join the conversation. If you want to hook up with us, look for Sypster, Braxwolf, or Angyll in-game. Project Gorgon: It’s really exciting to see the Kickstarter continue to push forward, as it’s growing by $1-2K a day. Up to $16,400 as of this writing and plenty of time left. Here’s hoping they shoot past the goal this weekend and get a lot more than expected by the time all is said and done. I’m glad that it’s getting more press and word-of-mouth this time around. World of Warcraft: Looks like Blizzard is going to announce the newest expansion next week instead of waiting until November’s BlizzCon, which is a smart move. Lots of anxious and disgruntled WoW players out there over the short expansion cycle, so here’s hoping that Blizzard is going to not only tell the community what the expansion is but also announce that it will be coming a lot sooner than expected. Lord of the Rings Online: I still haven’t re-installed LOTRO since getting the new computer so I’m not part of the current drama/migration of the server merges. It is something that needed to happen, and I can only pray that Turbine handles it smartly without shredding too many of its sub-communities. SWTOR: I ran a flashpoint last night — the Nar Shaddaa one, I forget the name — and started to doubt my Twi’lek’s destiny as a healer. Oh, I healed just fine, although it is frustrating to do so with such a limited array of tools. I don’t know how the bodyguard heals at higher levels, but right now it feels like running around with bandaids when people are losing limbs. So I did take a peek at the two DPS builds for the merc and mulled over if I want to keep pushing forward as a healer or to just wimp out and give myself some serious firepower. No change yet, but long slogs through flashpoints while tossing out ineffectual heals and overheating are not endearing me to healing right now. There isn’t a flashpoint set on Nar Shaddaa, so I’m quite intrigued… did you do Cademimu perhaps, with the crazy general at the end? It’s been a while since I levelled as a trooper or bounty hunter healer, but at least back then it was a question of alternating between casting big heals and spamming your small, free heal, which should keep your ammo/heat at manageable levels most times.